Spielberg’s segment, “Eyes,” is the second of three, and just as notably features Joan Crawford in one of her last performances. Crawford plays a blind heiress who blackmails a doctor into performing a risky surgical procedure that will restore her eyesight, but only for 11 hours. The surgery requires some poor soul – in this case, a down-on-his-luck gambler (Tom Bosley) who needs the cash – to donate his optic nerves, losing his own sight in the process. Like so many Twilight Zone episodes, “Eyes” and the other two segments lead their characters toward a cruel and ironic twist of fate. Most of “Eyes” takes place in the heiress’s luxury apartment, but Spielberg keeps finding fresh and compelling ways to frame his scenes. While it’s an impressively competent debut, I struggled to find anything recognizably Spielbergian in “Eyes.” But he may have had influences like Orson Welles and Akira Kurosawa in mind – more than once he uses their favored technique of deep focus to symbolically place characters in the foreground and deep background. The other two segments are fine. “The Cemetery” features an enjoyably villainous turn from Roddy McDowall as a Southern sleazebag who murders for an inheritance, only to question his sanity when paintings in the mansion seem to spontaneously change in ominous ways. In “The Escape Route,” a high-level Nazi hiding in post-WWII South America (Richard Kiley) tries to will himself into a picturesque landscape painting after being found out. Much like The Twilight Zone, Rod Serling introduces each segment in a blackened room, except here he unveils a painting related to each segment. These paintings appear in the episodes themselves, though unlike the other segments, the “Eyes” painting doesn't figure directly into that segment's plot. I’m glad I watched Night Gallery and I’ll watch the series eventually, but the segments only intermittently sprang to life for me, and the scares are pretty mild. 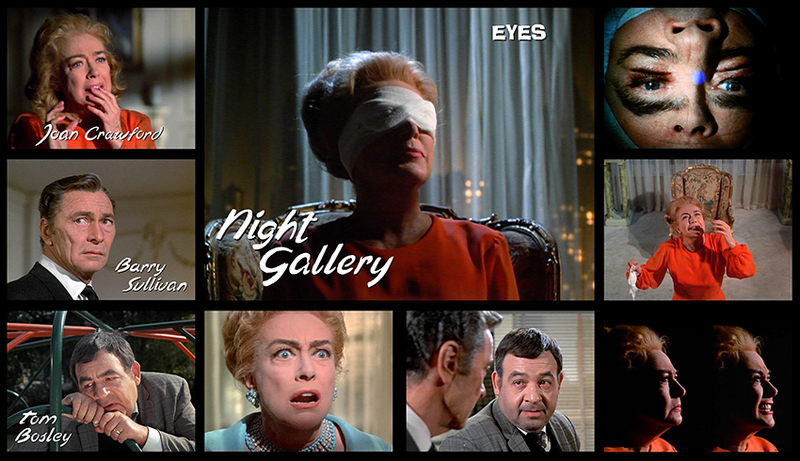 For anyone simply interested in seeing where Steven Spielberg began, Night Gallery is easily a worthwhile watch.